The Saturday late night event has been cancelled. However, preparations are being made for it to occur this fall. Plans are being settled to bring the late night food cart gathering to the Shockoe Design District in the fall with the hopes it becomes a regular or semi-regular event. Forget the aging leftovers in your fridge, because later this month, late-night snackers will have much tastier options to choose from. On Saturday July 28th, food carts will convene for the “Midnight Monster Food Truck Court Rally” from 11:00 PM to 1:00 AM in the parking lot of La Difference (at 14th and Dock streets). The event will be put on by GrowRVA, which organizes the regular Monster Food Truck Rally held at the Virginia Historical Society. 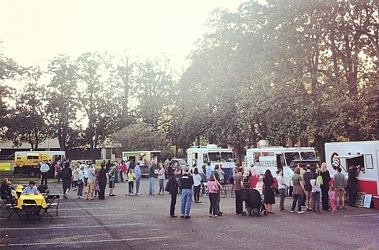 Atkinson organized the late-night food truck event for Richmond “because it hasn’t been done here before.” She hopes the event will give the city a unique taste of its ever-growing food cart culture. The event also aims to highlight the Shockoe Design District, an area of town trying to brand itself as a key center of creativity.